How do you rope in your big Tiger? 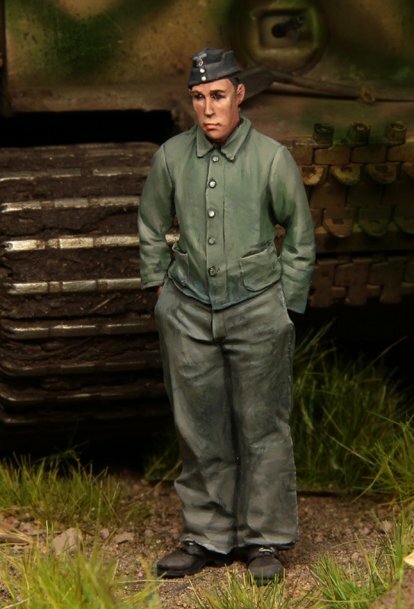 Stalingrad Miniatures has a solution with this figure – part of a big set to suit summer weight tankers – let’s have a look at him built up to see if he is up to our high expectations we look to Stalingrad for. 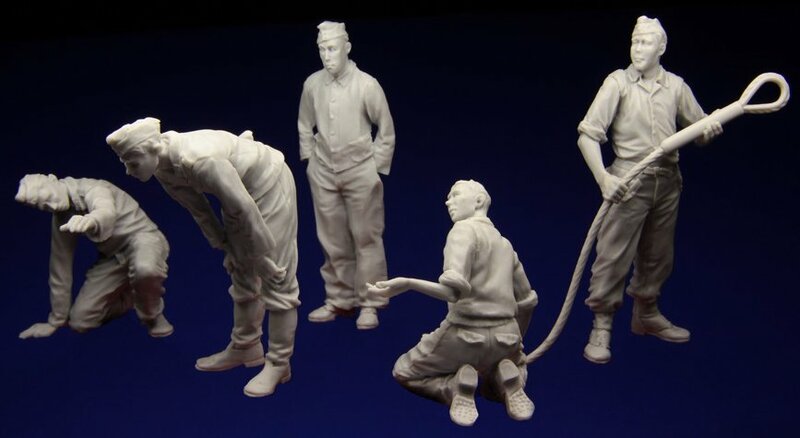 6 parts of grey resin comprising two figures. 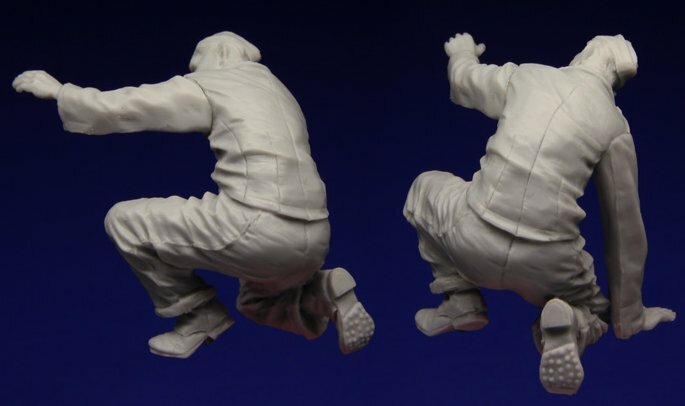 Alex fro Stalingrad is one of our favoured sculptors we a chance to review here on TMN. 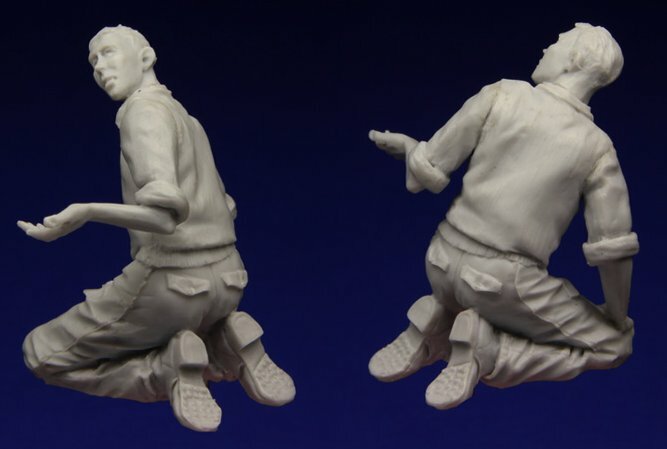 The pathos that he gives to the faces of the people he sculpts and the attention to body language and the physical stance of the characters he creates usually makes us just shake our head and ask "How does he do it?" With that comes a lot of expectation however - and i for one look closely at everything that comes from Stalingrad with a critical eye - looking for a slip up and any flaws. A bit unfair i guess, but not everything can be "sublime" , or "magnificent" can it! 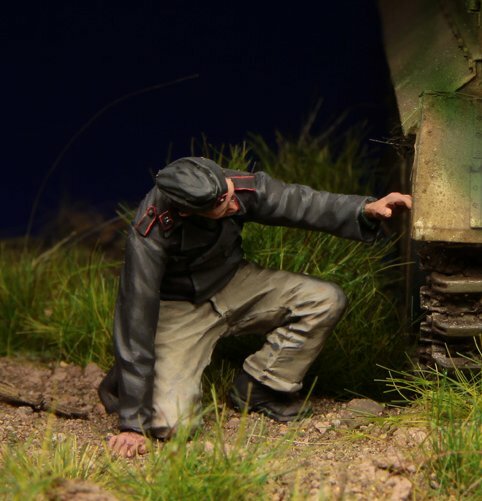 The big set that this soldier comes with looks pretty good though - and so we examine of of these tanker crew with a big problem of how to fix a panzer in the conflict in Kursk 1943. 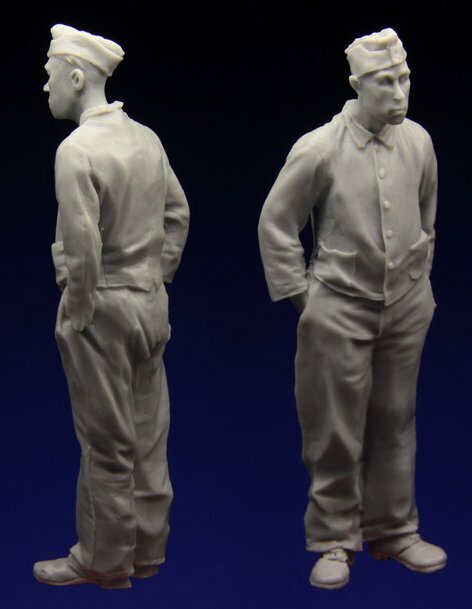 This soldier is made from light grey resin, and he come in the little square box and secure in a zip-loc bag. His parts are attached to the casting/pouring blocks he was cast in, and these are not too hard to remove. The one his torso sits on is actually a good pedestal for painting and working on the figure. The parts were bubble free on the surfaces, to remove them from the sprues isn't too much of a "clincher" as the pouring blocks are in sensible places so putting him together wasn't too hard. He has the choice of only one head - high cheekbones with a strong face and jawline with a thin pointy nose and a look on his face of a passive character who just appears to be waiting for the other guys on the crew to sort out the mess so he can hook it all up.He also wears his side cap with panzerwaffe pink piping on it . You can see these small fine decals on the cap and the cockade clearly so picking these out to paint with be a lot easier. I also lie the folds and soft texture of the cap which sits slack straight to the head of the figure. A simple uniform of the black tanker’s pants with his standard issue shirt dominate the torso of this soldier. In fact what really pops out is the wrinkles on the sweaty looking and well worn uniform pants and shirt. The folds of soft cotton pull and sag as he lifts the large weight of the loop up high. His pants also bag and sag, especially over the gaiters which sit on top of his short service boots. It is the details which make this otherwise very simply dressed soldier look just that little bit more polished. The buttons, flaps on the pockets and the limp belt coming out of the fastener is more of a good thing. You can even see the laces on his boots for goodness-sakes! 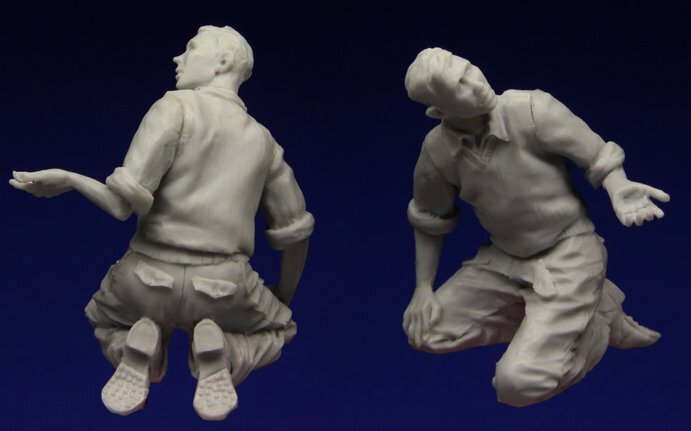 The arms on this soldier do require a little work to attach to the figure. The cloth on the arms follows the rest of the figure in being baggy and rolled up on the sleeves. 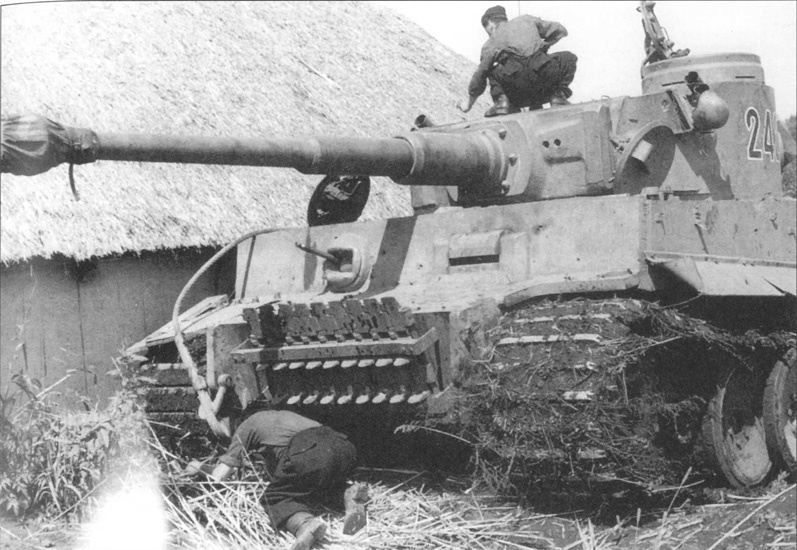 The fact that he is in the heat of the battle of Kursk and probably working up a sweat make this suitable. The inside of the hands need a little clean out but otherwise these match what's already on show. The last two parts of the figure compose the towing cable and the large loop for attaching to other vehicles. Now this needs your attention. Looks wise its is great but having the attachment at a critical point makes it delicate. Use a fast drying superglue to secure it in place and then another layer over this to further strengthen the joint. The cable is a little too thin to put a steel pin in it to secure it. 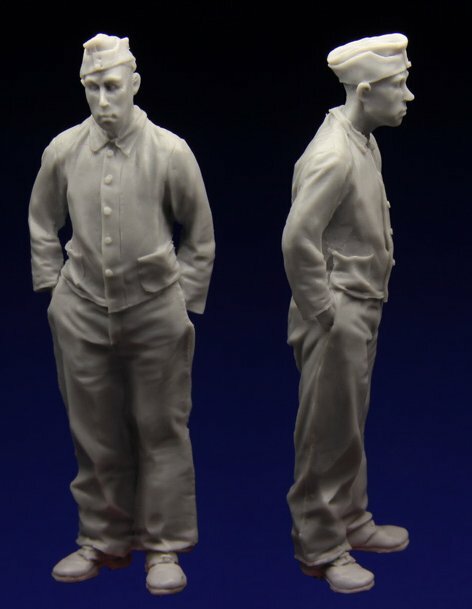 Here he is unpainted all together. On mine i could have done a little work to get the arm joints fitting better but time was pressing so here he has a slight gap. This would fit into the look of the soldier anyway with the thick cotton shirt's seams. 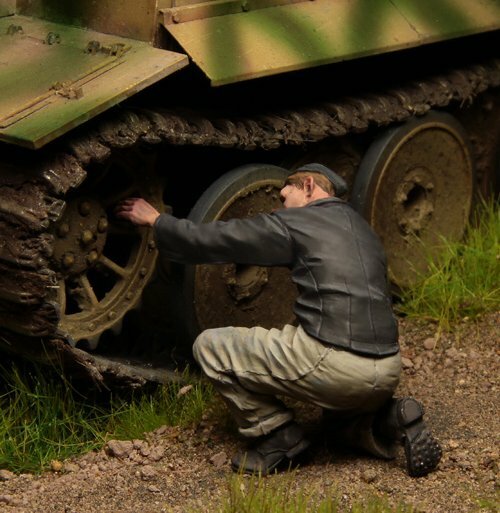 The link comes with the figure and the loop looks MASSIVE next to him – I suppose the tank is pretty big as well. 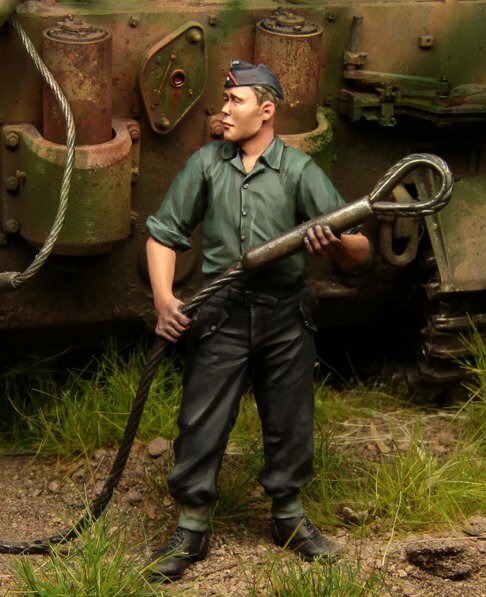 This is a man I can have in my tank any day – he already has a heavy towing cable in his hand ready to attach it to the hooks on the tank ready to get the disabled tank outta there! Well like I said - I do look closer at some companies work to see if they are resting on their laurels. This time I have been pretty satisfied with what is on offer. The sculpting and body language is dead on. He looks great and the restrained body language wets off this soldier from the others in the same set who are a little animated. Every person has their place in life and this guy is the quiet achiever! 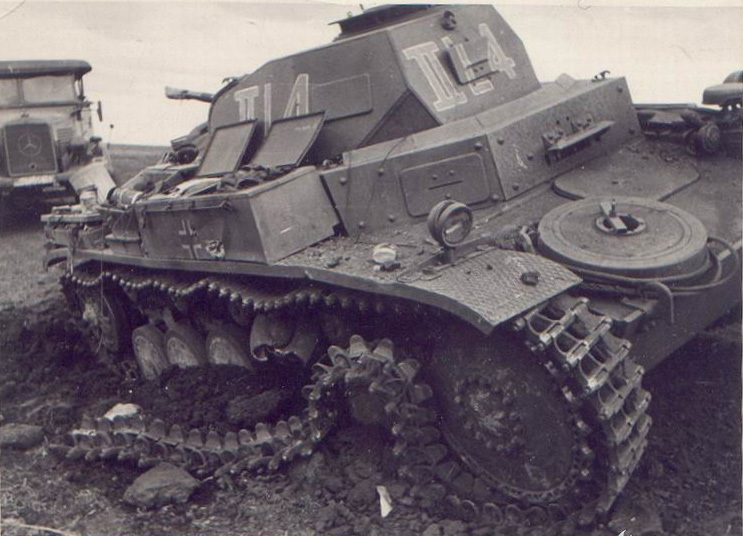 A well made figure who will fit into many a busted Panzer (or any other Wehrmacht vehicle needing a tow) scene. Great work as usual ! As a bonus here he is painted up - along witht he other crew in this set.. 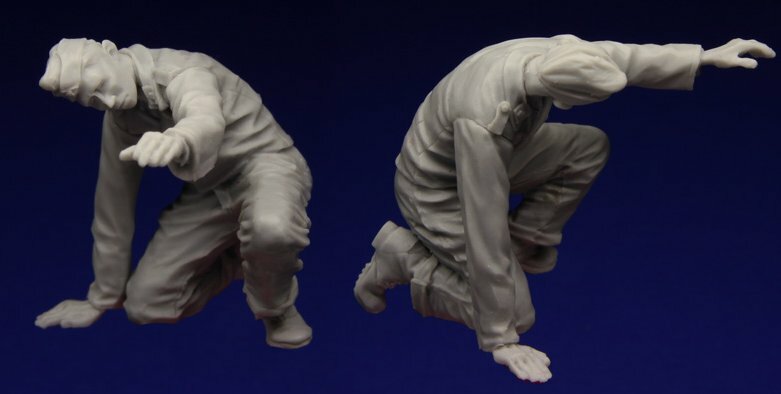 This large new set from Stalingrad includes five new figures that look like they are trying to fix the running gear on their Tiger from the period of “Operation Citadel” - the attack of the Kursk pocket in 1943. We previewed them a while ago here and they make quite a set! 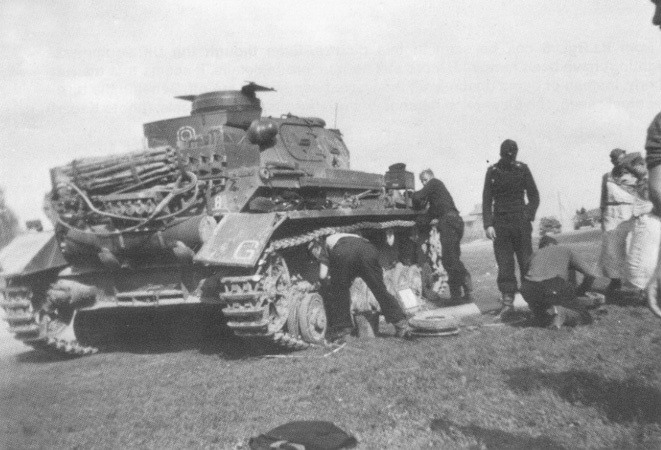 This set sees a five crew of a tank trying to fix their broken down panzer that looks to be immobile. 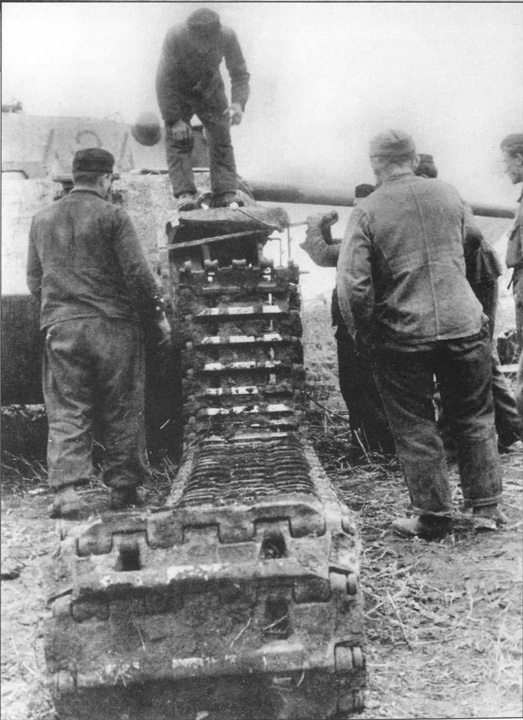 Quite fitting for a crew at Kursk where there were several breakdowns from the brand new Panthers, Tigers and Elephants.. 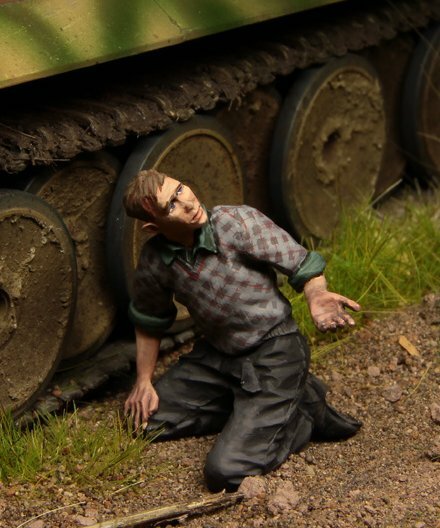 This junior tankman is seen here almost in a display of dismay as he gestures to his officer “I don’t know how to fix it” with his body language and facial features. 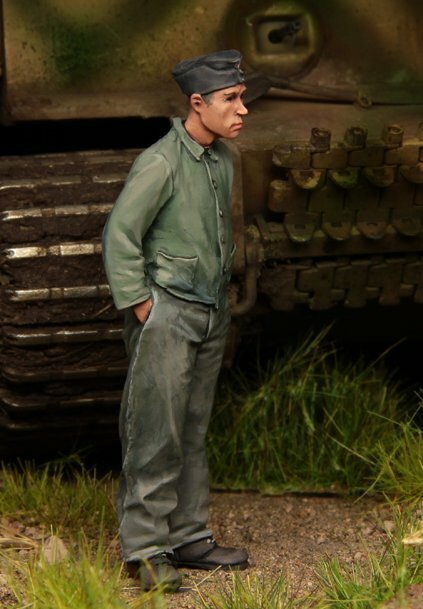 Sculpted by Alexander Zelenkov (as are all of these figures) and painted by him to – interestingly this young tanker is seen wearing his own jumper. He still has his black pants and hobnailed boots on but the choice of a chequered jumper like this is fairly common for soldiers on the Eastern front who had to improvise with whatever clothing and equipment they could. 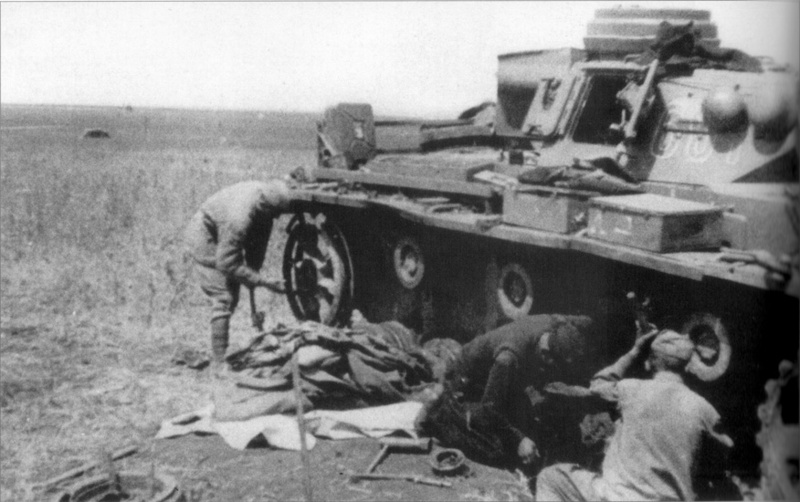 This panzer officer is seen here in his black wrap short panzer crew jacket and grey service pants and boots. His officer’s pistol is threaded through his belt in its harness and it sits on his rear hip. 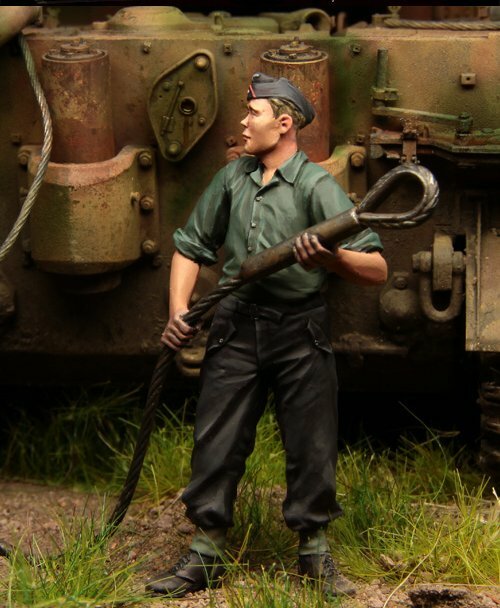 The paining job here shows him as the officer with his silver piping on his shoulder boards and the “Waffenfarbe Rosa” pink piping which denoted the panzer crewman of the German army. He looks on with concern as after all it’s his job to get this beast running again! 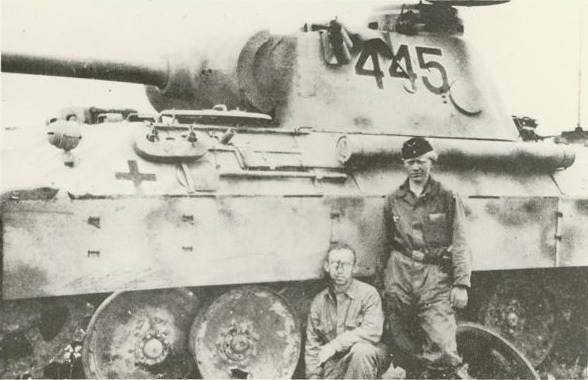 This panzer crewman also has the pink piping on his jacket as his fellow crewmen, he is seen here in a black panzer wrap again with a brimless field cap to protect his head in the tank and from the elements. 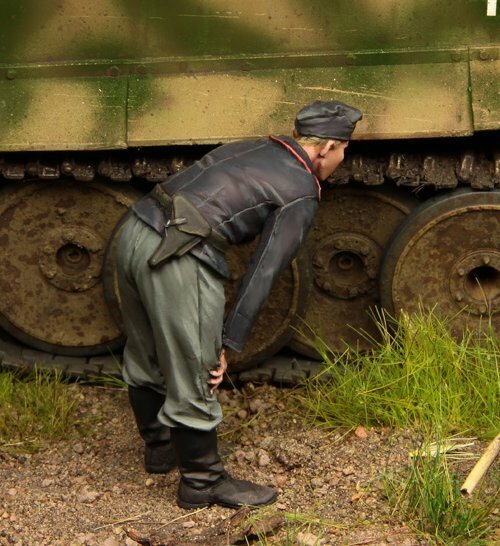 This man is a doo-er – he is seen here looking on with his comrade at the running gear of this tank. He is deep in thought as to how to get the tank running. Notice the wrinkling on his jacket arms and pants. Very nicely done. As opposed to this young man! He is seen here – looking very young and sheepish as he looks on - hands in his pockets of his too big for him pants and jacket. 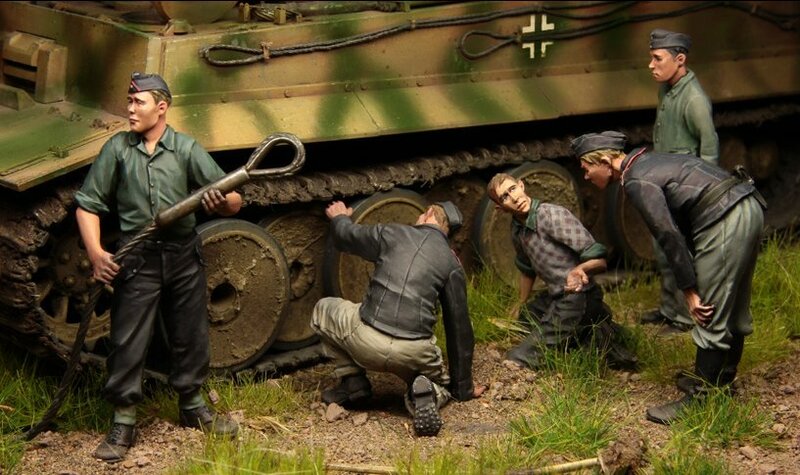 He very much looks like he is the junior crewman in this group – maybe he feels a bit guilty as to why the tank has stopped? Maybe…. He does look pretty guilty..